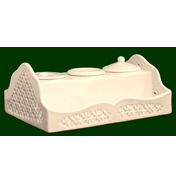 At the more exclusive end of Royal Creamware production is the 'Original Collection' of pottery pieces. Rich in creativeness these pieces offer a freshness and novelty that are very much at home in the modern world however they are historically correct reproductions of items that were made during Georgian and Victorian times. 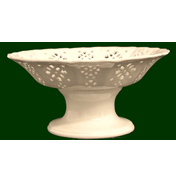 With each piece being the same body, weight, size and design detail of the original using Royal Creamware’s ingenious and delightful hand piercing and translucent glazing skilfully re-created precisely to the 18th Century specification. Featuring superior pieces that will capture the imagination of the discerning collector, the Originals Collection has all the distinguishing appearance of the early Leedsware creamware with the added beauty of modern glazing methods. Although the glazing is prepared using current materials the whole process of manufacture is almost identical to that used in 18th century, where slip (molten clay) is poured into a plaster mould. Water from the slip is absorbed into the highly absorbent mould leaving a layer of clay body taking its internal shape. Further drying is allowed, any pierced work required is performed and then left before initial firing. Careful stacking is required for the kiln as they are extremely delicate at this stage and after many hours of slow temperature build up to firing temperature, the whole kiln content is left to cool before glazing. Equally at home in museums and large houses or estates the creamware will blend in to modern contemporary surroundings with ease. The simple pastel cream is a gift to interior designers where often brash pottery design and finish can conflict with their colour scheme or design theme. Choose one of these wonderful Originals pieces for your collection at home today. 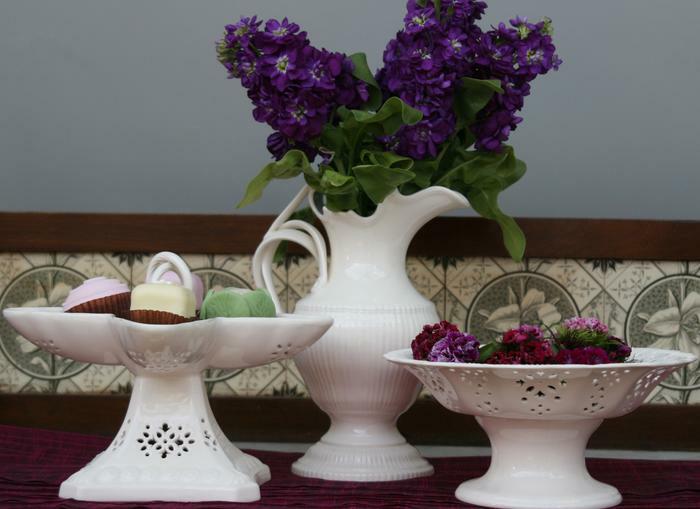 In the Originals range we have the Platt Menage, Ewer and Fruit Stand.